Our firm holds an outstanding position in the market as the manufacturer, supplier and exporter of Ceramic Fiber Rope. These products are made from an exceptionally stable fiber material that is soft, non-irritating and non-hazardous in nature. Extensively used in very high temperature static sealing duties or slow rotary applications, these products replaces ceramic yarn packing and radiation seals in BOS plant. Known for their premium quality, these products are also used as kiln packing, stem gland sealing on valves handling very high temperature gases and door seals for annealing furnaces at steelworks and protective surfaces on pottery kiln cars. Ceramic Fiber Rope can resist high temperatures hence, it is used for thermal insulation & heat resistant duties where flexibility & resilience are required. Ceramic Fiber Cloth is a compression packing for very high temperature duties. It is manufactured from an exceptionally stable fibre material that is soft, non-irritating, non-hazardous & is not limited by World Health Organization or European Union restrictions. These heat resistant fibres are produced using advanced chemical fibre technology. They are spun into a flexible yarn in the UK, together with a low percentage of glass fibre and Inconel wire reinforcement. 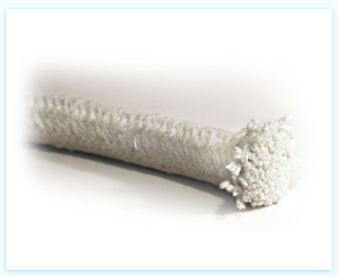 Ceramic Fiber yarn, Rope, Cloth contains no organic agents or processing additives. It therefore retains its physical and chemical properties at very high temperatures and does not decompose into hazardous substances, as happens with many normal ceramics. Compression packing of Ceramic Fiber Product Hi-Temp are recommended for very high temperature static sealing duties or slow rotary applications. It replaces ceramic yarn packing and radiation seals on BOS plant, and ceramic packing and vessel lid seals on secondary steelmaking plant. Ceramic Fiber Textile resist Hi-Temp include braided insulation sleeves, webbing tapes, ladder tapes, twisted ropes, lagging ropes, blankets and paper, and woven cloth. These are used for thermal insulation and heat resistant duties where flexibility and resilience are required. Average diameter of the mineral fibre used in Ceramic Fiber product Hi-Temp is 9µm which is considered non-hazardous to health. No protection for breathing, eye, hand or body is required by the World Health Organisation or European Union during the product's normal storage, handling and use. Hi-Temp is available as densely braided compression packing - square, round and rectangular - in sections from 5mm to 100mm, and in any length. Full fitting instructions are included. Other constructions of Hi-Temp are manufactured to order. Asbestos Centre (Ceramic Fiber Manufacturers) is incorporated in the year 1996. We are CRISIL Rated Company, We are engaged in Manufacturers, Supplier and Exporter of a wide range of Asbestos Products across the world. Our range of products consists of Asbestos Industrial Packing, Asbestos Packing, Sealing Products, Insulation Products, Asbestos and Non Asbestos Jointing Sheet, Asbestos Friction Products and Non-Asbestos Packing, Sealing Products more. These meet the demands of textiles asbestos products, Gasket product, friction products and many more. By his vast industrial experience of 30 years our mentor, Hasmukh C. Shah, helped us to achieve greater heights in the industry. He is very cooperative and gives excellent support to us to provide superior quality products to our clients.